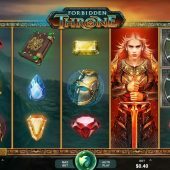 Forbidden Throne slot appears to be inspired by the hit TV series Game of Thrones (with Microgaming currently has a slot dedicated to). Forbidden Throne has overtones of rivalry, battle and fantasy, with transparent reels over a foggy backdrop of stony hills and mountains. The dramatic music loops in the background, creating even more similarities with that previously mentioned dragony show. 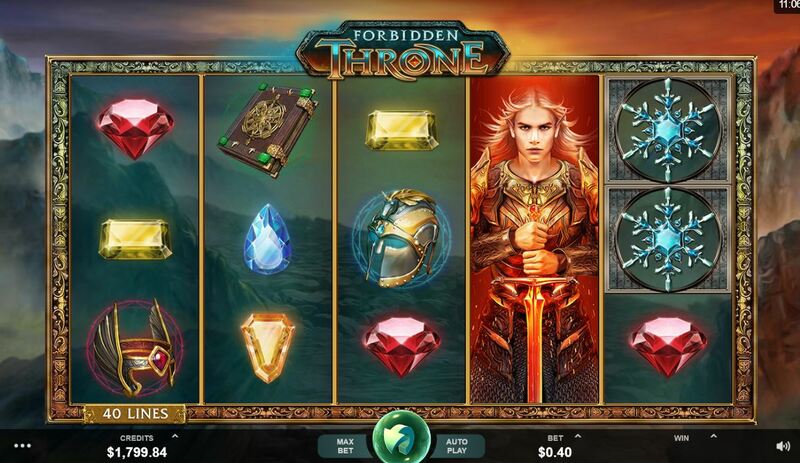 So will this game let you see the forbidden riches? There are 40 pay lines spread over the 5 reels of 3 rows each and the first thing to note is the fact you get at least one Wild reel each spin and these are spectacular animated characters from the world of Forbidden Throne and they still allow a scatter to land on them too. There are the game logo Wilds on all reels as the top pay of 12.5x bet for the 5-of-a-kind and these appear singly with no multiplier attached. The Gold Suns and Snowflakes can appear stacked and pay 5 and 2.5x bet respectively for the 5, followed by the helmet, book and wings at 1.25x, 1x and 0.5x respectively. There are no card values, instead we see coloured gemstones with low pays down to 0.2x bet for 5. The final icon is the Gold Whirlpool and this is the scatter we need 3 or more of in view to trigger Forbidden Throne's bonus round. For 3 scatters you get 10, 20 for 4 and 30 free spins for 5. You can retrigger them too and the game becomes more spectacular as we enter this realm. Each spin will yield at least 2 Wild reels instead of 1 in the base game, and unleash some more of those character graphics when involved in a win. A full screen of Wilds will pay the game's top win of 500x bet if you are fortunate!